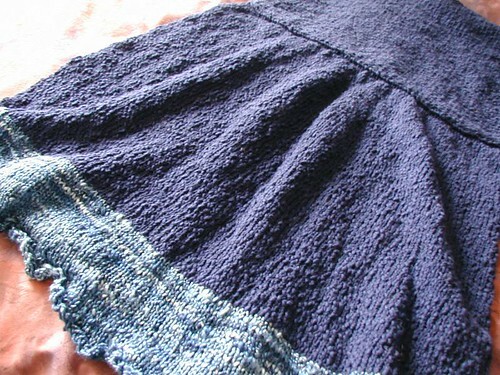 The skirt doesn’t have many increases; I just changed needle sizes bigger and bigger as I went down the skirt. Makes for a nice swingyness! The top/bodice is just a simple tube, knit double-stranded from side to side, and drop waist – it actually holds things in pretty nicely. I’ve attached the straps today, and wove in all the ends, so it should be out and in action tomorrow! It’s really quite comfortable and flattering. I might add a few decorative buttons, I’m not sure yet. That’s adorable! I’m so impressed at how you whip things up! It takes me a least a month to knit a pair of socks. I’d love to see that one modeled. I can’t quite picture the fit, although it looks lovely. I LOVE your sundress! Is there any hope that you might post the pattern? I love how the handspun adds just the right amount of accent. Your dress is super cool and I definitely want to see a modeled pic! yo lady. i’m in class and it’s sooooo boring right now. but really, the dress is so friggin’ cute it’s worth remarking upon. adorable dress. very very adorable. i do question a double knit top (mostly b/c of bulk) but will hold off on judgement until i see it (and you) lookin’ hot. still on for wednesday? btw i started a sock with that yarn and it was all pooly and makes me sad. So cool! You’re making us all jealous. Oh this is SO cute! What pattern is this from? And what yarn did you use? Cute! Can’t believe you get so much done and still keep up with your studies! what’s your secret? LOVE this — I can’t wait to see how it looks on! Wow! I LOVE that! I can’t wait to see a photo of you modelling it! I love those shades of blue. Your handspun silk really makes the dress. And congratulations for making it to the finish line! This is SO pretty. I too would love to see it modeled! 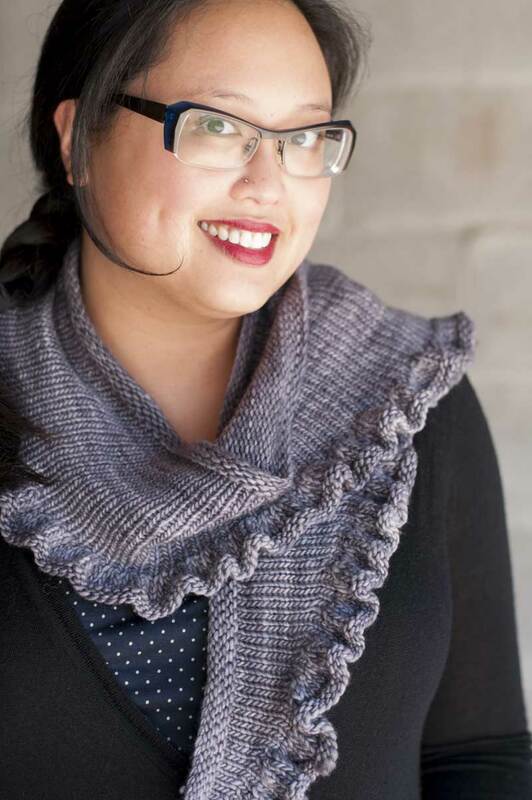 I’d love to see what it looks like on you, great use of the handspun! Holy crap that’s cute!!! Now there is a knit I would purchase right off the rack! That is really adorable. 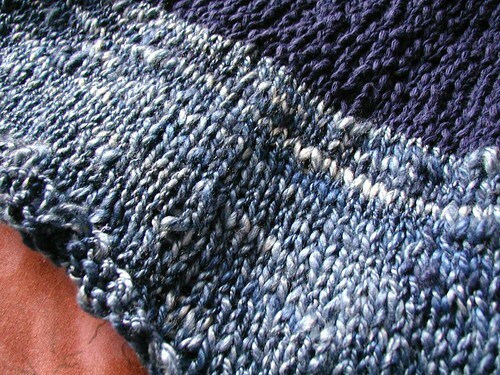 I think the handspun yarn for the bottom edging turned out beautifully, too. I can’t wait to see this on. Looks smashing! i agree, the handspun at the bottom adds great flair. quite a lovely summer stunner! That looks great. So, just a little question: does it have a front side and a back side or are they pretty much interchangeable? That is really cute! 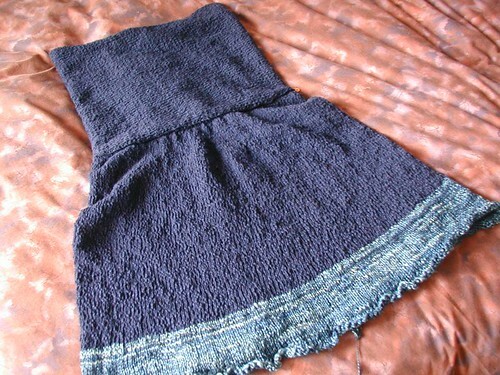 It’s the best knitted dress/skirt I’ve seen. I love that color, and the bit at the bottom really adds to the cuteness! I can’t wait so see it on. Just adorable! That is so cute and summery. Cannot wait to see a photo of you wearing it. loverly. can’t wait to see it on – love your patterns. The sundress looks so absolutely cute I can’t even stand it. Please show us a modeled shot!